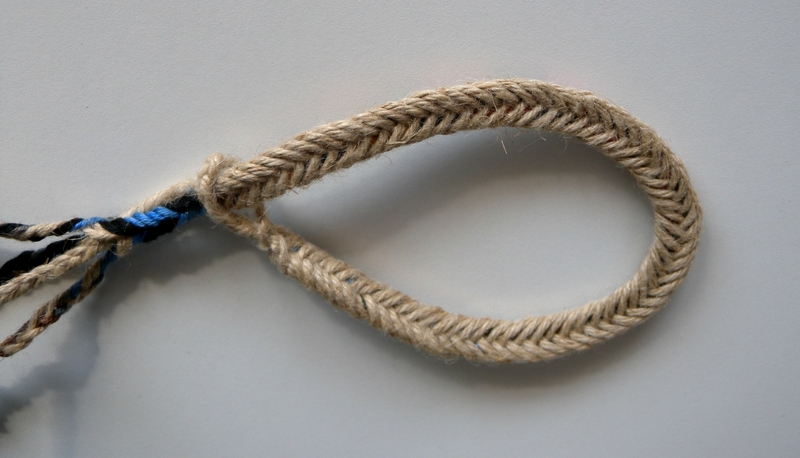 In fact, the most common fingerloop braid worldwide was probably a five-loop Unorthodox braid—the one called “a broad lace” in the medieval loop braiding manuscripts. That’s not the braid I’m teaching here, though. It has a lot of color-pattern possibilities–the one below looks quite different from both of the braids in my video, but it’s really the same braid, with a different arrangement of colors in the initial set-up of the loops. 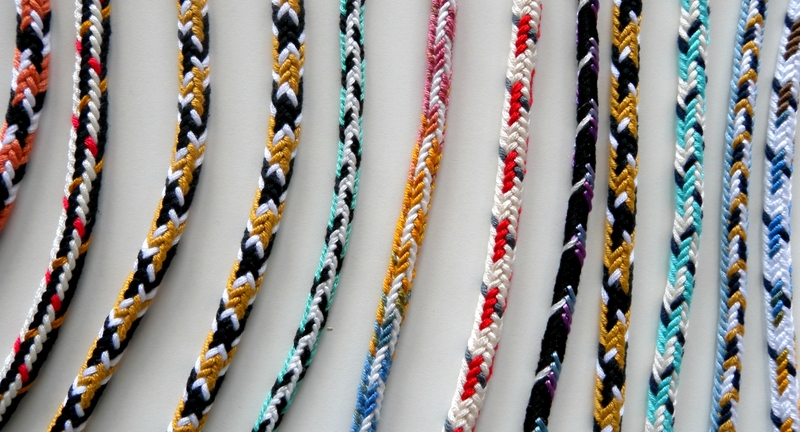 D-shaped braid–a different type of braid from the more well-known “broad lace.” (Top view) The ‘D-shape’ isn’t apparent in a flat photo, but the black center line down the braid is higher, and the colors slope down to the edges of the braid. In some of these braids the loops were turned while being braided, and in others the loops were not turned. This doesn’t give the same results as with square braids! Sport-weight multi-strand mercerized cotton yarn (most braids). One of the fun things about this particular type of Unorthodox braid is that you can make it with one color on the bottom surface and a mix of different colors on the top surface. 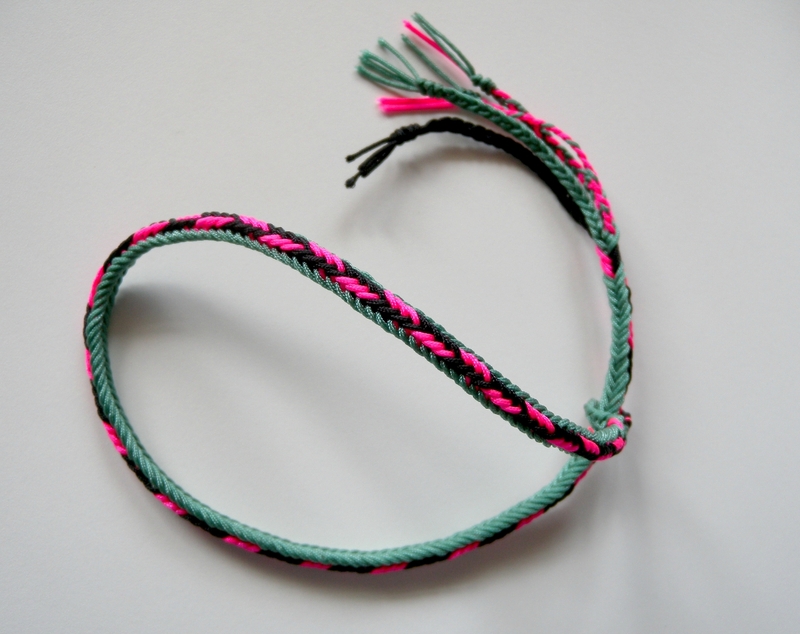 This is done by using bicolor loops, and not turning any of the loops that you move while braiding. In a square braid, that would make the braid divide into two separate layers, but that doesn’t happen with unorthodox braids. Reverse side. While in progress, this side was facing down, but you could choose to make it the “right” side. I braided most of my samples using smooth, mercerized cotton yarn about twice as heavy as embroidery floss (all discontinued brands that I’ve had lying around for years). Using doubled strands of embroidery floss gives the same effect – I sometimes use both in the same braid. Along the way I also made a few samples using Chinese knotting cord (a synthetic blend of some kind), and some with waxed cotton cord, which is another firm, semi-rigid braiding material. 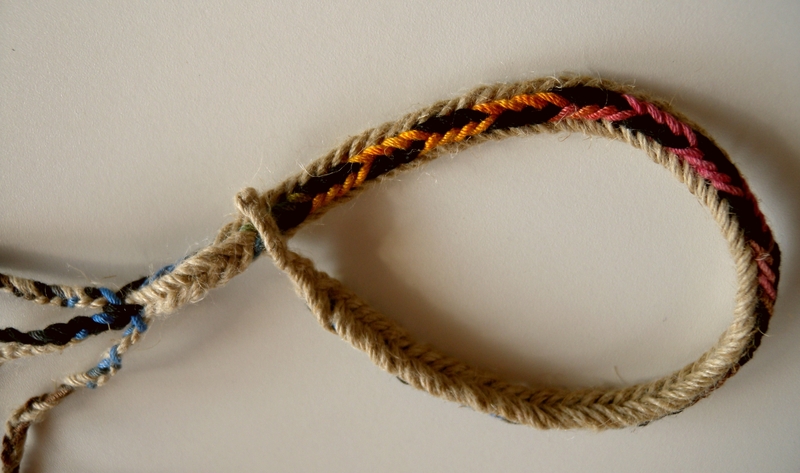 Center braid: thin waxed cotton cord (brown, 0.5mm) and cotton embroidery floss. Other two braids: thicker waxed cotton cord (light blue, 1mm) and sport-weight cotton yarn. 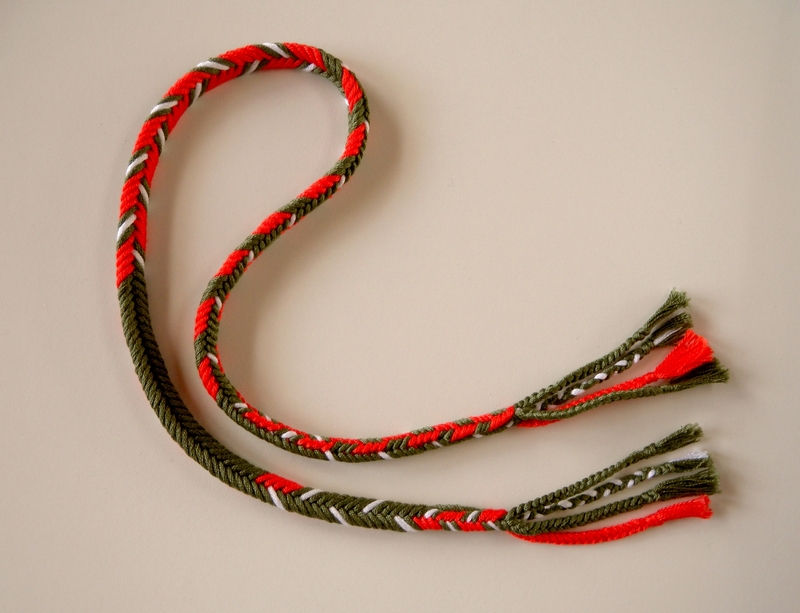 This is the first color-pattern my video teaches (though not with the waxed cotton cord of this example). Waxed cotton cord looks and feels very leather-like and rugged, so as bracelets these have a nice firm heft to them. And the contrast between the two types of thread gives the top of the braid an almost beaded or embroidered look. Waxed cotton and chinese braiding cord are tricky to tighten* — learn the braiding moves with cotton yarn or embroidery floss before trying to braid with stiffer cord. 10/4 linen, and mercerized cotton knitting yarn in 2 colors: black and variegated (orange-to-turquoise). The video below demos how to make both variations of this Unorthodox braid (turning loops and not turning loops). Left hand: A,B,C,D fingers each hold a bicolor blue/black loop, black shanks in upper position. Right hand: A,B,C fingers each hold a bicolor blue/white loop, white shanks in upper position. Note: In this video I don’t explain the moves that are the same as 7-loop square braid moves– review that video if anything here is unclear. If you are new to loop braiding, it’s best to learn the 5-loop braid first. 00:00-5:45 Introduction to the D-shaped “unorthodox” braid, and its two variations (turned vs not turned loop transfers). 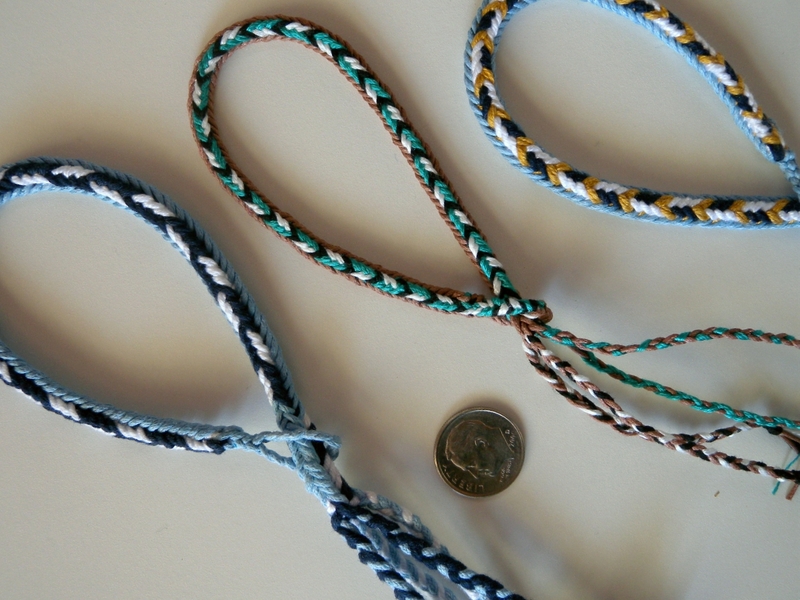 I show several D-shaped braid examples in various color-patterns, before starting the braiding instructions. 3:45 Here I show the two patterns I will be braiding in this video, first the first pattern, made without turning loops. 5:45 Starting the braid (see loop color set-up instructions just below the video window). 9:14 Loops are back in starting set-up positions, ready to start second braid pattern. 9:34 Showing the second braid pattern that I will now be braiding. 10:17 1st move on left, with the loop now being turned as it is transferred. (Be sure to turn the loop ‘from above’ rather than ‘from below’). 13:38 Showing new pattern emerging in braid, front and back. 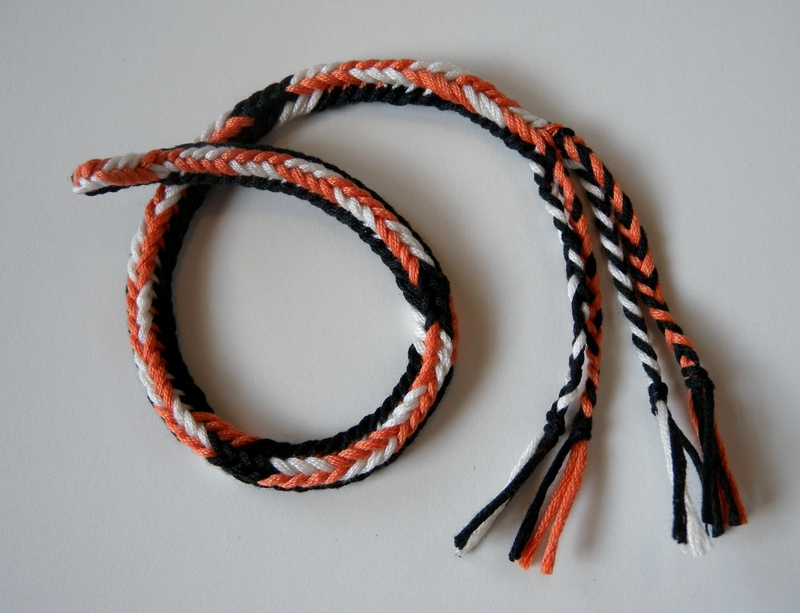 Then comparing to orange,black,white braid in which I switched occasionally to turning loops for just one pattern repeat, and then returned to braiding without turns. 15:08 Reprise of turned loop procedure. 7-loop D-shaped braid pattern sampler with matching ends. Each end has a loop (buttonhole-type opening) just above the fringe, though these aren’t very visible in photo. For more about Unorthodox braids, hover on the About tab in my upper menu, and click on Unorthodox Braids in the drop-down menu. *2. In the more well-known type of UO (unorthodox) braid, it’s the loop or loops near the center of the braid that are “skipped over” by the braider. The operating finger (and therefore the loop that it transfers) only goes through the loop or loops closer to the outer edge of the braid. It’s exactly the opposite for the UO braid of this tutorial: Here, it’s the outer loop that is “skipped over” —the loop nearer to the edge of the braid. The transferring loop is only pulled through the two loops that are closer to the mid line of the braid. It “skips” above the whole loop at the edge of the braid, rather than going through it as it would for a square braid. This makes a noticeable difference to the resulting structure and appearance of the braid. UO above means Unorthodox finger loop braid. This is not two braids later combined together, as you might think from Kinoshita’s description. It is a braid with two visible columns (ridges) of slanted threads on one side, and four visible columns of slanted threads on the other, like the braid I am teaching in this tutorial. In the unorthodox braid of this tutorial, the flat bottom surface has only two lengthwise columns (ridges) of slanted threads. The threads in the two ridges have opposite slants, so together they form upside-down V’s down the braid. On the upper surface of the braid, 4 lengthwise columns/ridges are visible (creating busier color patterns on the top of the braid than on the bottom). The 4-ridge side is rounded, and the two-ridge side is flat, as in the braid Masako Kinoshita describes. There’s a photo of the Khanty braids alongside her description, but it’s not detailed enough to see the braids clearly. 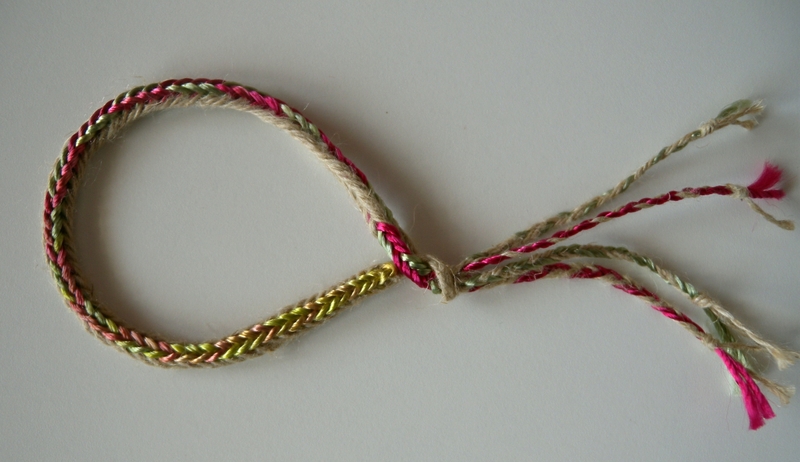 The closeup photos in her article are not of the Khanty braids–they are of a 5-loop braid Kinoshita made (using nylon cord), that from her description is not of the type of UO braid of this tutorial. Correction!!! I just found Masako Kinoshita’s more detailed description of the way she braided her hypothetical reconstruction! It’s near the end of the page in the following link — “illustrated instruction series #2“. The “Illustrated Instruction Series” are how-to pages that are separate but parallel to each LMBRIC issue. Kinoshita’s reconstruction method for the Khanty braid is exactly the type of Unorthodox braid I’m teaching here, though done with 5 loops rather than 7. Even the “regular” type of unorthodox braid has some surprises when done with the V-fell braiding method that I teach on this site. I plan to make at least a few more tutorials on those as well, for various numbers of loops. Try to let the loops hang somewhat slack as soon as you begin to bring your hands together after tightening. This makes it harder to do the braiding moves, unfortunately. But in my experience with this type of stiff cord, getting an evenly-tensioned braid is very dependent on the bends/creases you make in the cords each time you pull the loops out to the sides, so it’s best not to undo and and straighten out those creases by pulling the loops tightly towards you during the next move. April 21, 2015 in Color patterns. I know you always recommend to start on the 5 loop braid for beginners, but I jumped straight to the D-shape and it’s by far my favorite braid. I love all your tutorials, they are very thorough and informative. I’m looking forward to your other 7 loop OU braid tutorial when and if you post it! Thanks! I love these UO braids, too! and yes, I am working on that next tutorial right now after a long blog hiatus. It’s written up, but I’m hoping to get just a few more samples made, then the photos and video. It should be out in a week or two (fingers crossed! If not, it’ll have to wait til I get back from our Aug camping trip). I absolutely love this 7-loop UO braid; this braid, and the spiral ones, are my favourites ones so far. Thanks again for all your hard work on this super website. Don’t see how anyone could complain about the knowledge you are freely sharing. I’m with Sidsel: thanks for all the joy you spread! You’re welcome and thanks for the nice note!!! Just finished my first unorthodox braid. I really like it. Started divided to get my fingers going then on to straight through then turned. Mi think I like the look of the turned braid, but really both are nice. Used 5/2 cotton. Think I will try some hand spun (it’s tightly spun for braiding) as that will make a bigger braid and show colors better. Will send along a picture later. Thanks so much, Ingrid for sharing this Braid! Ingrid, thank you again for your sharing all your leidenschaft with us. I read your comments and footnotes and got interested in slentre versus your way. And so I tried the slentreWay on the sevenloopbraid. And it works, you have to turn the loop you take, but it works. I taught the slentre way to 9 to 12 year olds, they love it. We do three different patterns: braid like, “round” and “one side braided, one side “knitted” “, all with five loops. Im looking forward to the colorpattern for the redwhiteblack, or maybe Ill be able to find out how you do it..
Hi Sidsel, it’s so nice to hear from you again! I’m glad to hear you tried the braid a different way than I demo’d, good for you! The slentre method should work fine for 5 and 7-loop unorthodox braids. Your students are lucky to be able to learn braiding in your class! The slentre braid you describe that looks knitted on one side I’m fairly sure must be the other type of unorthodox braid, in which you skip the first loop and only go through the second. (For a 5-loop braid–for a 7-loop version, you could also try skipping the first loop and go through both the second and third loops to get the little finger’s loop.) Your round braid is perhaps like the one I call square? I am curious about the one you say looks “braid-like”! Thanks for trying this tutorial!! I will post the pattern for the red/white/black braid soon. 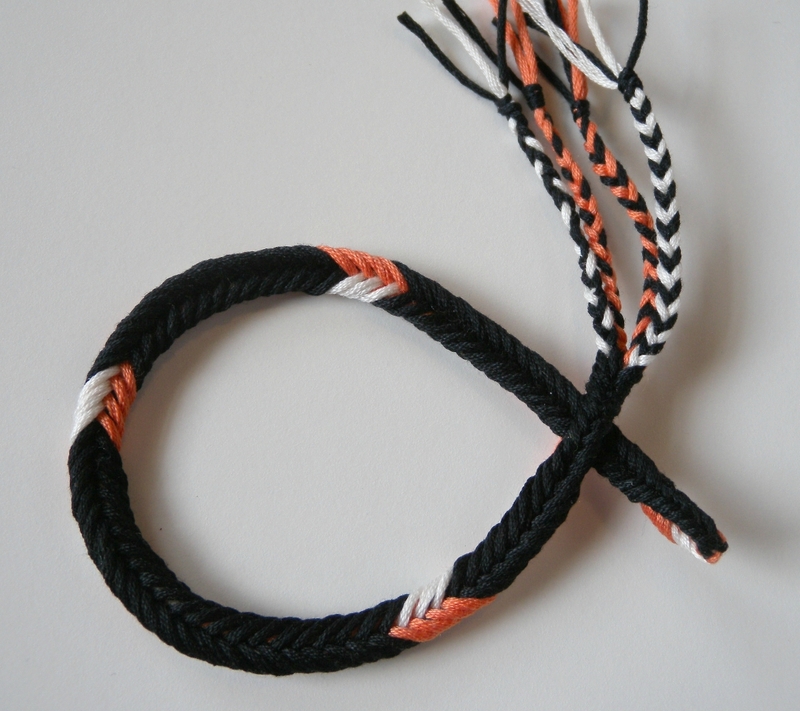 Hi Sidsel, just wanted to let you know that the instructions for making the red, white, black D-shaped braid are in my most recent post: One setup; four color-patterns. I hope you like it! Hi Ingrid, yes, I already tried the blue-golden one! And turned it on to slentre-ways, and ended it doing through all loops and grab the last: one side as orthodox, one side broad braid simple way. By braid I mean the hairbraid sort of simple way, but here its a braid of plenty;-) Your patterns simply beg for being made, and this double-side-thing ist so wonderful, nobody grasp how it could be made. My sisterinlaw wached your tutorials after I showed her how to start up; she just mailed to say your homepage/tutorials are so good, that even no-english-speakers have joy! Now I must look for other yarns, so the patterns will come out better. Thank you again for all the joy you spread. Well, i’ve just bookmarked your video! I shall try this one when I get an hour to myself next week. Yay! If anything isn’t clear in the video, check out my 7-loop square braid video. This D-shaped braid is just a slight variation of the moves for a square braid. Good luck and happy braiding! Ingrid, these are phenomenal braids. I am going to have to try some. thanks so much! Hi Connie! Thank you! I think you’ll love these braids, they are easier than double braids, yet just as fun and rewarding. I’ll get going on posting the setups for those other color-pattern variations soon! These are very handsome braids. Thank you for the posting. Hi Valerie, You’re very welcome, and thank you so much for visiting and commenting! Thanks for such a FANTASTIC piece of work on these braids. I thoroughly enjoy your videos which are an information pill on the technique – and can happily learn from you, rather than ( ..it would take me years!) from a book. Again, thank you. Awww, thanks for the compliment! And it’s a relief to hear you enjoy the videos, I tend to be so overly wordy that I get my fair share of of complaints on youtube (youtube viewers don’t hold back the way blog-readers tend to!) I hope you try the braid, it’s a very fun variation of a 7-loop square braid with a distinctively different look.